Mr Kiran Karnik is known for his many accomplishments as a visionary administrator. But it was his outstanding work while serving as President of NASSCOM (2001 to 2008) that is most lauded. (NASSCOM is the premier trade body for India's IT and BPO industries.). As NASSCOM Chief he proved to be the driving force behind India's offshoring wave. In the preceding decade, Mr Karnik had been at the helm of a few other organizations. Milestones for that period include the launch of Discovery Channel in 1995 in South Asia and Animal Planet (a Discovery-BBC joint venture) in 1999. Prior thereto he was Founder-Director of the Consortium for Educational Communication (CEC) which is hailed for the 'Countrywide Classroom' broadcast initiative. Mr Karnik has also worked at the Indian Space Research Organization (ISRO) for over two decades where he was a key player in the pioneering India-USA Satellite Instructional TV Experiment and the Kheda TV project. Accolades earned during his richly diverse career include the 'Padma Shri' in 2007, 'DATAQUEST IT Person of the Year' in 2005 and being selected by Forbes magazine as 'Face of the Year 2003' for showcasing India's BPO strength to the world. Currently he is engaged in advisory roles for many not-for-profit organizations in the fields of education and development. Mr Karnik also writes frequently – he is a regular contributor to major national dailies and has authored 'The Coalition of Competitors – The Story of NASSCOM and the IT Industry. Chairman Jain Irrigation Systems Pvt. Ltd.
Jain Irrigation Systems Ltd (JISL) is well known as the company whose path-breaking drip irrigation system helped farmers in drought-prone areas to maximise their yield. At the helm of this far-sighted organization is Mr Ashok Jain always exploring new horizons and new concepts to improve farmer's lives. Since joining the company in 1989, he has infused new enthusiasm and energy into its operations and steered business towards more dynamic growth. Besides micro irrigation JISL also provides solutions in piping, infrastructure, renewable energy solutions, agro-processed products, tissue culture plants, financial services and other agricultural inputs. The company has manufacturing plants in 30 locations across the world bringing revenue of approx. $1bn. Besides contributing to food security and sustainability, JISL, under Mr Jain's leadership, also devotes resources, time and significant effort for the social sector. He has founded Jain Sports Academy and provides generous support to deserving players. A man with a golden heart, Mr Jain is ever-ready to reach out with medical aid for a needy associate or citizen. He has also provided support to several artists by hosting their exhibitions at 'Bhaunche Udyan' - the theme park which he constructed within a record period of 70 days. Above all he continues the Gandhian legacy given by his legendary father late Shri Bhavarlal Jain. President & Mentor: Pathology Services, Super Religare laboratories Ltd.
Dr. Avinash Phadke leads SRL Diagnostic which is the India's largest Diagnostic chain with 346 laboratories in India and 12 laboratories abroad all consistently achieving National & International Accreditations. Under his leadership SRL Diagnostic won the Best Diagnostic Service Provider of Year' Award at the Six Sigma Healthcare Excellence Award-2015; The World's Greatest Brands & Leaders 2015 - Asia & GCC; Knowledge Management Leadership Awards 2015 at Asia Pacific HRM Congress; and the Healthcare Leaders Forum Award 2015 for SRL Global Knowledge Forum in category of "Innovative Use of Technology by a Diagnostic Service Provider" organised by e-Health. He is currently Teacher for M.D. Pathology at Mumbai University, besides being guest faculty at Tata Institute of Social Sciences and B.A.R.C. for Radio-immunoassay Training Course. Each of these labs has state-of-the-art equipment and is certified by ISO or by National Accreditation Board of Laboratories, (NABL) Govt. of India. His work has earned him a long list of awards that includes Quality Council of India's Professional Achievement Award, Best Laboratory Award, Healthcare Express Award, Times of India Group of Publications' Professional of the Year Award and top ranking for two years in the India Today Survey. He has also written many scientific papers that have been published in national and international journals and has participated in over 400 conferences. Shivrai Technologies Pvt. Ltd. has top its credit a host of innovative solutions for agriculture in India and abroad. However, the most talked about product from the company is FarmERP. This popular agribusiness software 'FarmERP' has changed the way farmers do farming. 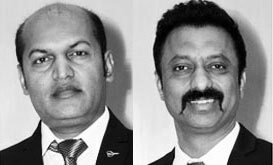 Entire credit of Shivrai Technologies goes to the two legendary founders CEO - Sanjay Borkar and the COO Santosh Shinde, both Computer Science Engineers from Pune, who had firmly set on a decision to start up their own venture. Like many other IT Professionals, both Sanjay and Santosh had got offers from overseas IT companies, but they refused as their decision was too firm on breaking their own code. Their vision was "to transform agriculture with their innovative IT solutions". FarmERP is a complete solution covering purchase, inventory, production, post production, planning, farm profile, accounts, contract farming and HR. In effect, it has given farmers and agribusinesses a smart system to manage their agricultural business processes, thus improving operational efficiency and increasing profitability. FarmERP is widely used in India, USA, Turkey, Thailand, Middle East, Azerbaijan and South Africa. Their list of accomplishments includes Manthan Award 2005 – GOLD 'E-Learning' Category, Manthan Award 2009 'Mobile Content' Category, besides felicitation by Dr Balasaheb Sawant Konkan Krishi Vidyapeeth, Dapoli and Mahatma Phule Krishi Vidyapeeth, Rahuri. Co-founder, Director: Outgo Payment Solutions Pvt. Ltd.
Ms Chetana Pawar reflects the modern day Indian woman in every respect: ambitious, tech-savvy, always dreaming the big dream. But Ms Pawar goes a step further than the average person. She has the courage to try out something new. When she was declared winner of the Women Power 2016 Award, it more than recompensed for all the hardships and the risk she had taken when she chose to establish her own start-up Outgo Payment Solutions Pvt. Ltd. The Outgo Payment platform offers the perfect example of woman power. Before founding Outgo, Ms Pawar had a well-paying and cushy job at IBM, India and before that she had worked for eight years in the UK. She quit IBM to pursue her start-up dream. After studying the market and prospects for a year, she launched the company Outgo which simplified and streamlined the volume of recurring payments for the service sector. The platform helped also in the automation of their processes and provided a better way to communicate with their customer base. Outgo was ranked among the top 50 Fintech companies at the Fintegrate event in Mumbai. Ms Chitra Mete has a simple yet unique definition for work: 'if you do something that improves people's lives in some way, then you are truly working'. This philosophy is amply reflected in every endeavour that Ms Mete is engaged in. As an entrepreneur, her company Chaitra Creations and Publicity produces path-breaking communication for leading brands as well as social issues. As an artist, she has followed in the footsteps of her father, the legendary artist and principal of Abhinav kalavidyalay, Pune, Prof. Raosaheb Gurav, by founding Sumbaran Art Foundation. Sumbaran promotes art and culture through various workshops. As a social worker, her educational project Sujaan addresses issues like child sexual abuse, disaster management, yoga, water conservation, etc. As the director of Khadi & Village Industries Board Handmade Paper Institute (Papertells), she plans to introduce many new eco-friendly products. She also made an animation film titled 'My Nature' which received 'Viewers' Choice Award' at Anifest-2015.